A few days ago I posted the first part of my focus on Make Up Academy's (MUA) basic line (click here to read it ) but I said there was more to come, so here it. As well as eye and lip products the MUA line also features a range of face and cheek products and of course nail polishes. 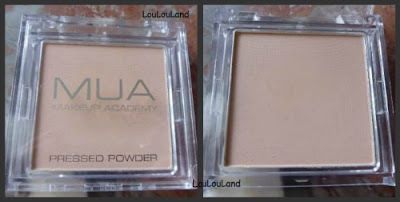 The only proper face product in the MUA basic range to my knowledge is a pressed face powder, I believe it comes in 4 shades and unsurprisingly I went for Shade 1, the palest one. At just £1.00 for 5.7g of product I have to say I was pretty sceptical, a lot of face powder at the best of times can be floury and powdery so my hoped weren't they high I have to say. It wouldn't be any sort of make up range with something to cheer up our cheeks, and once again the MUA basic line has done us proud with a bronzer in several shades and of course several blushers. I own 3 of the blushers, which are in rectangular pans, and in similar black and clear packaging to the eyeshadows. Like the face powder they also have a distinctive floral aroma. First up Shade 1 - Apologies in advance for the appearance of this one but I took it on holiday with me last year and it didn't quite survive the baggage handlers. This is quite a scary hot pink in the pan, and I have to say it is super pigmented, just a tiny little swipe of the blush and you have more than enough for your whole face and more, but it blends down to a lovely flush of pink. I usually cant stand coral but you so rocked that shade. So beautiful. I know it's onluy £1, but i have enough pink polishes in my collection but i am very tempted to get this pretty shade of pink. Love the Nail Polish shades, so pretty :).